We are currently developing detailed architectural designs for a new purpose-built dance studio in Wrose, near Bradford, on the site of an existing garage. The proposals seeks to create a bespoke dance studio with ancillary accommodation to serve a high local demand. The development will comprise of a stand alone two-storey building facing the parallel main road, with generous parking facilities behind. Internally, a dance studio on each floor will also be served with excellent changing and shower facilities, offices, wc’s and storage. The external appearance is fairly bold and contemporary, although the palette of materials, featuring rendered walls, grey stone slips, washed out weatherboarding, and glazed curtain walling, will not look out of place along the street-scene. The West elevation features a full-height two-storey glazed opening with coloured glass panels, which should be an attractive feature when illuminated by the afternoon and evening sun. The building will also feature a fully glazed band at roof level, which will be supported with a concealed steel frame. 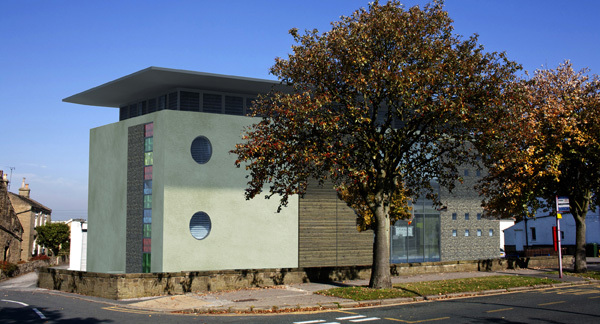 We were appointed to provide architectural services for this project towards the end of 2011, and aim to submit a planning application to Bradford Council, along with developing the scheme further in 2012.